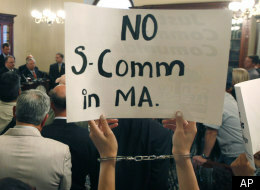 The much-debated Secure Communities project took effect in Massachusetts last week. So, is everyone feeling more secure? Probably not. Under Secure Communities all arrests made by local police departments will result in fingerprints being sent automatically to Homeland Security (home of Immigration and Customs Enforcement, or ICE) as well as the FBI. Local police have long been required to share prints with the FBI, and for years have had the option of sending them to ICE as well. Now the sharing is automatic. The hope is that this information from local law enforcement will help ICE differentiate immigration violators who are dangerous criminals from those whose only crimes are immigration-related and who don’t pose a threat to public safety. That was the Secure Communities promise from the start. The program lost credibility when turned out it had resulted in the detention of thousands of non-criminal offenders. The Obama administration has sought to solve that problem while finding some way to cope with the backlog of deportation cases clogging immigration courts. Despite setting new records for the number of deportations completed, thousands of suspects are being held for long periods in federal detention facilities, often without due process rights and at great taxpayer expense. This gusher of new ICE referrals under Secure Communities won’t solve those problems. Instead, we fear it will be like trying to fill a water glass from a fire hydrant. Local officials can’t do much to resolve problems at Homeland Security, but they can prevent misinformation about Secure Communities from poisoning communications between police and immigrants in their towns. An unfortunate byproduct of the debate over Secure Communities is the widespread fear that the program involves a crackdown by police on immigrants who are not involved in other crimes. MetroWest police chiefs say the program will change nothing about how they do their work. There will be no profiling, they say, and no efforts to do background checks on people who report crimes, use emergency services or seek medical help. Area police chiefs are bringing that message to immigrant communities, but they need help in passing it on. However you feel about Secure Communities, nobody is helped by driving a wedge between local police and the residents they are sworn to protect. This entry was posted in Press (Massachusetts) on May 23, 2012 by Ian.